Shekhawati is situated in the Northeast region of Rajasthan and is the homeland of marwaris. The marwaris form one of the most important merchant and business groups in India. They developed their business acumen on the trade routes between India and Central Asia. The marwaris enjoyed protections by Maharajas and many of them built grand havellis. The havellis are mansions, elaborately and attractively decorated with a strong main entrance. The Shekhawati tour has been designed specially for those people who are very keenly interested to visit the Shekhawati region and as well as the havellis present in this region. Around midnight arrive in Delhi. The cosmopolitan City and capital Delhi is the main gateway for travelers. Upon arrival, you will be met by an Indo Vacations representative and transferred to the Hotel. After having breakfast we drive to Mandawa in the Shekhawati region. 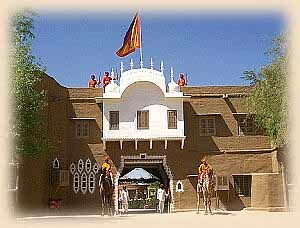 One of the major place in the Shekhawati region is Mandawa. Mandawa was founded in the 18th century. The Chokhani and Ladia havelis and the street with Saraf havelis are some of the splendid havelis in Mandawa. A medieval fort dominates the town of Manadwa. This fort has a painted arched gateway which is adorned with Lord Krishna and his cows. The fort is now converted into a heritage hotel. Arrive in Mandawa in the evening. In the morning we drive to Sikar. In Sikar we would visit the Gopinath, Raghunath and Madan Mohan temple. We also visit the Biyani Havellis. In the afternoon we drive to Ramgarh. In Ramgarh we visit the Shani Temple as well as the Havellis of Poddars. In Ramgarh we can have a look at the rustic wood furniture which is unique in this area. In the morning drive to Fatehpur. Fatehpur is famous for its frescoes in the Indian as well as western styles. The most interesting Havellis in Fatehpur are the Havellis of Chamariyas, Singhaniasm, Goenka and Jalan Havellis. Afterwards we visit the town of Bissau. Bissau was founded in the mid 18th century. Bissau has splendid chhatris of its Thakurs and well painted havelis of Khemka, Tibriwals, Thakurs, Jhunjhunuwala and Kedia. Bissau also has a Fort and the Chhatri of Hammir Singh, which has paintings on it. After visiting the town of Bissau we visit the town of Churu which is famous for havelis of Kothari and Kanhaiya Lal Bagla with marvellous life-size paintings of Dhola Maru, Sassi Punu etc. The Surana haveli has more than eleven hundred doors and windows. Today we will visit the Fort of Lachmangarh which is one of the most impressive fort in Shekhawati area. It is worth going up to the top to get a view of the town below. The town planning seems similar as Jaipur, the capital city of Rajasthan. Nawalgarh was a central point for many of the trader families who decorated their havellis with the fresco paintings. Some of them are Poddar Haveli, Roop Niwas, Saat Haveli. One can also visit a few temples and the fort of Nawalgarh. The morning is at leisure in Mandawa. In the afternoon drive to Mehansar. Mehansar was founded in the mid of 18th century. In Mahansar we will visit the Sone-Chandi-ki-Haveli (Sone Ki Dukan Haveli) and Raghunath temple with beautiful paintings which seem to have their origin from the Bikaner school of paintings. Today we will visit Dundlod. Dundlod is famous due to its palace which has been now converted into hotel. The Goenka Havellis of Dundlod are also worth visiting. It is an amazing feeling going through the Suraj Pol, Bichla Darwaza, Uttar Pol of Dundlod Fort. Then we will drive further to Mukundgarh. Mukundgarh is more known for its fort than the havelis. The Mukundgarh fort has been converted into heritage hotel and is worth visiting. In the morning after having breakfast we drive to Bikaner. After a break we visit the Junagarh Fort constructed of red sandstone (1571-1611 AD) and marble with kiosks and balconies embellishing the structure at intervals. This imposing fort and its palaces will be an unforgettable experience for us. Today we drive through the desert and proceed for Jaisalmer. Jaisalmer is famous for its carved havellis (grand mansions). In medieval times, its prosperity was due to its location on the main trade route linking India to Egypt, Arabia, Africa and the West. Jaisalmer is a marvel of beautiful culture and this city remains one of the most exotic city not only in Rajasthan but in the whole of India. We arrive in Jaisalmer in the evening. In the morning drive to Jodhpur via Osian. Osian is a great centre of Hindu and Jain religions. The oldest Temple here was constructed in 1178 AD. After visiting the temple we proceed further for Jodhpur. Jodhpur was once the capital of the princely state of Marwar (Land of death). Jodhpur is the second largest city in Rajasthan. Jodhpur is also known as the blue city as most of the houses of the old city are painted blue. The old city is surrounded by a huge 10 km long wall which has 101 bastions and seven gates. We will visit the Mehrangarh Fort (majestic fort). Mehrangarh Fort was built on a steep hill and is among the best in India with exquisitely latticed windows in residential apartments within. We also visit the Jaswant Thada, a royal cenotaph built in white marble. Today we drive to the Pink City, Jaipur. This city owes its name, foundations and careful planning to the great warrior and astronomer, Maharaja Sawai Jai Singh II. Jaipur is the capital of Rajasthan and famous for its handicrafts and precious and semiprecious stones. In the morning after having breakfast we drive to Delhi. Arrival in Delhi in the evening. The rest of the day at leisure.